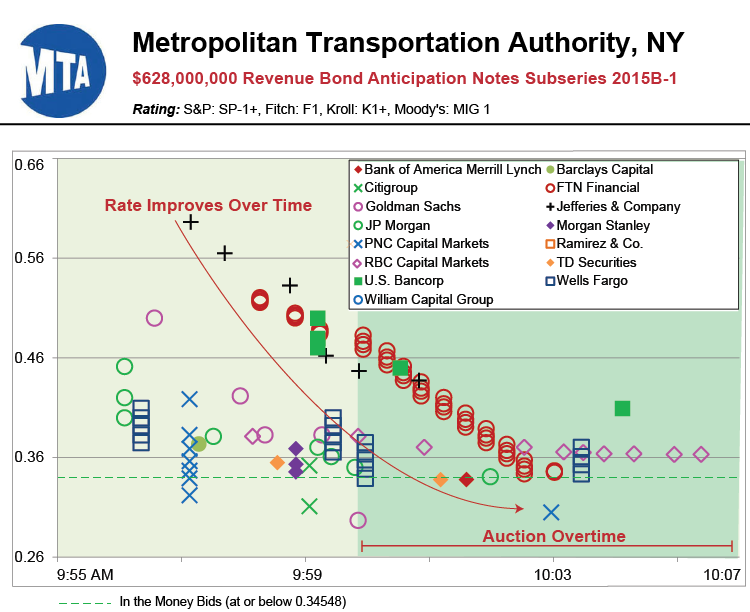 The New York Metropolitan Transportation Authority (MTA) was back in the note market again via Grant Street’s MuniAuction platform on Wednesday, December 2, 2015. The MTA competitively sold $628 million in tax-exempt notes. Last week’s auction followed the MTA’s initial MuniAuction sale in September 2015 of $500 million of Bond Anticipation Notes (BANs). PFM’s New York office served as financial advisor on both note transactions. During the December open auction, 15 underwriters submitted a total of 133 bids, and triggered the Two-Minute Rule 15 times. MTA allowed underwriters to submit partial bids. At the close of the auction, nine firms were “In the Money”: Bank of America Merrill Lynch, Citigroup, FTN Financial, Goldman Sachs, JP Morgan, Morgan Stanley, PNC Capital Markets, TD Securities, and Wells Fargo. If you would like to learn more about MuniAuction, or see a replay of the latest MTA open auction, please contact John McCarthy at 412-391-5555, ext. 1321 or John.McCarthy@GrantStreet.com.